The Email Notification on Download Addon is used along side the Simple Download Monitor Plugin to send the admin a notification email once a user has downloaded an item. This addon is useful when admin wants to be alerted immediately after someone has downloaded an item. Go to the Add New plugins screen in your WordPress admin area. Click Install Now and then Activate the plugin. Once you have installed and activated the Email Notification on Download Addon, a new menu is added to the SDM Plugin. Click on the Downloads menu. Click on the new Email Notifications menu. This is where you will configure all settings related to this addon. Enable this feature by marking the Send Emails to Admin After a Download checkbox. Enter in a Notification Email Address. This is where the notification email will be sent to. Generally this will be the email of the site admin. Enter in a From Email Address. This email address should be an address from your domain. For example, ‘Your Name <hello@yourdomain.com>‘. Customize the Email Subject. You may wish for it to read ‘A visitor downloaded an item‘ or similar. Add an Email Body. You can add merge tags to the body that will add details to the email. You can find Merge Tags for this addon below. Now once a user downloads an item, a notification will be sent to the email address you specified. The following Merge Tags can be used in the Email Body to add additional details about the download within the email. This will add the ID of the item that was downloaded by your user. This will add the title of the download to the email body. The screenshot below displays how to add both merge tags to the email body. 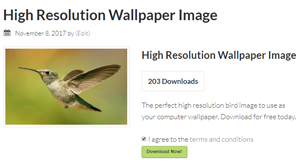 Step 1) A user lands on a site and likes the look of the Bird Wallpaper Image. Step 2) They click on the Download Now button. Step 3) After they click on the download button an Email is sent to the admin of the site letting them know someone has just downloaded an item. Step 4) Admin can easily view the email from their computer or mobile phone. 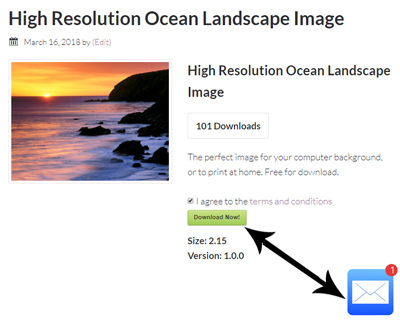 Allows you to create hidden download buttons for your downloadable items so the actual location of the file is never revealed.